When I was 8 or 9 years old, my dad was a member of the Green Bay Packers Fan Club. This allowed my father, after paying a due, to get a lot of stuff I didn’t care about. But it did lead to the day I met Reggie White. After going to Sunday church, we went over to Lambeau Field for Autograph Day and walked to where other people were standing. At some point, the gate opened, and my dad told me to run. I had no idea why we were running, just that we were going to meet the Packers. As we ran through the concourse, there were signs with player’s names hanging from each tunnel. Finally, we stopped. We stood in a long line for a long time, but finally, we saw the object of my father’s desire for his son: Reggie White. We walked up to him, and I gave him a piece of paper. He signed it, and gave it back to me. My dad nudged me, and a quiet “thank you” followed. And as I stood there, with my dad’s hands on my small shoulders, Reggie White looked up at him, raising his head in slow motion, and simply said, “Thank you.” The sincerity in his booming voice sent chills down my spine. I watched Reggie White do a lot of amazing things on the football field, most of which my dad told me No. 92 would do. He quickly became my favorite Packer player, a title he still holds almost 8 years after his death. 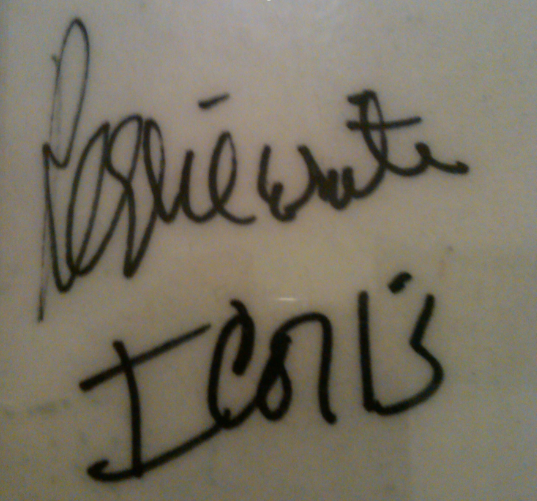 Reggie White’s autograph, including a reference to 1 Corinthians 13: And now these three remain: faith, hope and love. But the greatest of these is love. For the most part, athletes excel better at their sports than they do in life. Reggie White was a great exception.